We'll go through each specific condition within each of the three categories. 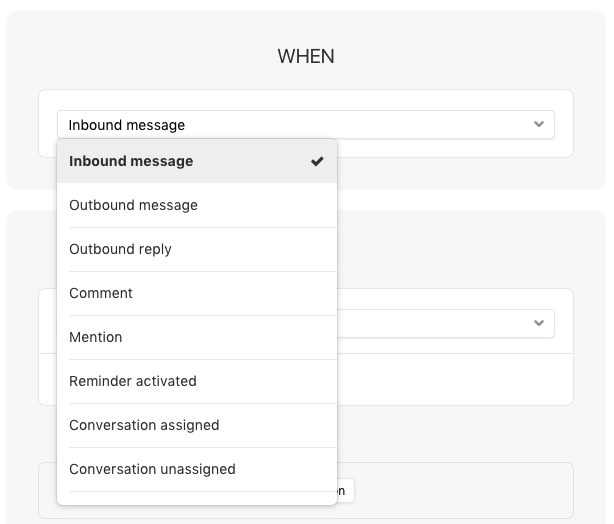 The When section contains triggering events that will cause Front to start evaluating the conditions of your rule and see if they are met. The If section contains the filters you've set that must exist in order for the actions to run. You are able to create conditions using And and Or types. Using And will require all the listed conditions to be true in order for the rule to take action. Using Or will require only one of those conditions to be true. You can also use a combination of these two types. More on how to use And/Or statements can be found in this article. 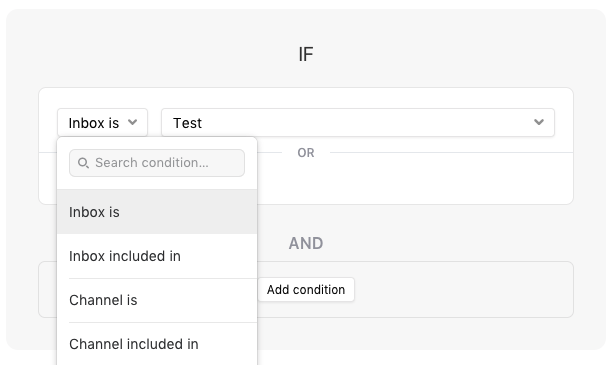 Some conditions allow you to type in your own text for the condition (such as Subject, Body, To, From), and you can actually list multiple keywords within one condition if these options are all Or type. You would simply separate the words with a semicolon (;). The Then section contains the list of actions that will result when all filters are met. The rule engine runs sequentially by default, meaning that the rule actions in one rule can trigger subsequent rules to run more actions. You have the option to check off Stop processing other rules if you don't want this to happen.